I don't know about you, but I want set of these that fit me. 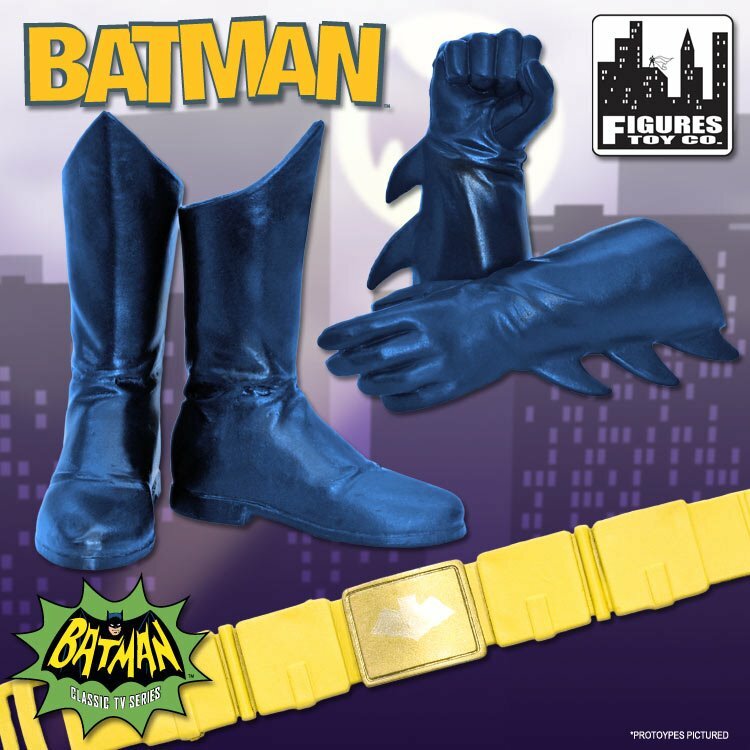 Yesterday we got a sneak peak of the gloves and utility belt for Figures Toy Co's Burt Ward Robin action figure from their Batman TV series line. Today we a get a look at the Caped Crusaders garb. FTC continues to blow me away with the attention to detail that they are putting into these figures and each preview gets me more and more excited for this new toy line. Even thought FTC is also producing "exact replicas" of the original Mego Batman figures they are for sure making the TV series line their own. Do think these gloves and utility belt are just as awesome as the Robin version? I have a terrible feeling we are all being punked because these look too good for any Mego-like Batman figure. I would have been happy with replicas but these are driving up the quality beyond what maybe the company can deliver. Their lines are very ambitions but I can't wait to see what they come out with. I don't know Cal, but these are directly from Figures Toy Company themselves and they say these are the prototypes. If they deviate from the prototypes there is going to be some major let downs. However, you are right. I mentioned before these are so good that FTC may have sold their soul to devil to be able to deliver such quality. Batman too? Well, maybe Alfred will come with oven mitts, then. Brilliant idea, which make me wonder, why isn't Alfred on the roster for anyones toy line yet?